Quinoa is actually a plant-based seed with a great nutritional profile that we consider to be a whole grain. It is a gluten-free complex carbohydrate and a great source of manganese, magnesium, B vitamins, and fiber. Not only is it anti-inflammatory, helps balance blood sugar, and supports digestion, but it also contains all of the essential amino acids that other grains don't have. The serving size for quinoa is 1/2 cup cooked. This vegan dish can be enjoyed as is, over a green salad, or accompanied with 3oz chicken or fish for a non-vegetarian meal. Combine quinoa, a pinch of salt, and water or broth in a medium pot and bring to a boil. Reduce heat, cover and simmer until water is absorbed, about 15 minutes. Quinoa grains will appear translucent when cooked. Remove from heat and let sit for 5 minutes. Uncover and fluff with a fork. In a large pan, heat coconut oil or broth over medium-high heat. Add onion and cook, stirring occasionally until transparent, about 8 minutes. Add mushrooms and cook for another 4 minutes. Add carrots and chopped pepper and cook for another 3 minutes or until soft. Add parsley and spinach and let spinach wilt. Stir in cinnamon, cumin, and cooked quinoa and toss gently. Add cashews, salt and pepper to taste and cook for another minute. Remove from heat and let cool until warm. 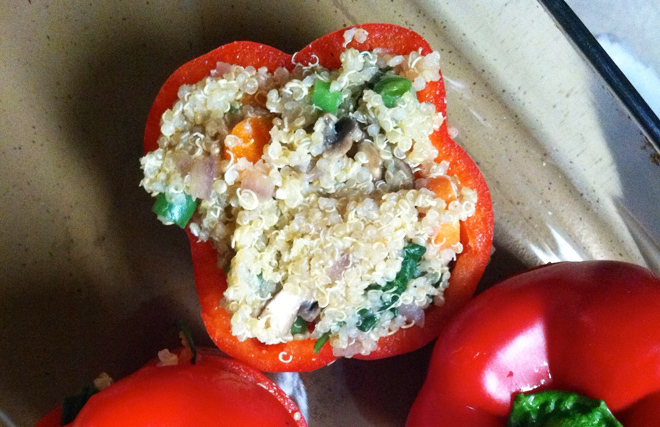 Take 6 remaining bell peppers and fill with the quinoa stuffing by gently packing it down with a spoon. Once filled, put reserved top on each pepper and set them upright in a 9 x 13 inch baking pan. Cover tightly with aluminum foil and bake for about 1 hour or until peppers are tender, check halfway through. Feel free to add your favorite vegetables to the stuffing and add some crushed red peppers or cayenne pepper if you want it to be a little spicy. I would personally omit the cinnamon if adding cayenne pepper. Flavors of Health by Ed Bauman, Ph.D. and Lizette Marx, N.C.